Spiritual practices have long warned against developing attachments to material possessions, as it can be easy to get sucked in. Our stuff can serve as an extension of our self and represent who we aspire to be. It can demonstrate our taste and values, and reveal what we need, want, or won’t let go of. Hoarding—the inability to part with any possessions no matter how worthless—has become a surreal staple of reality television, highlighting an affliction both fascinating and repulsive. 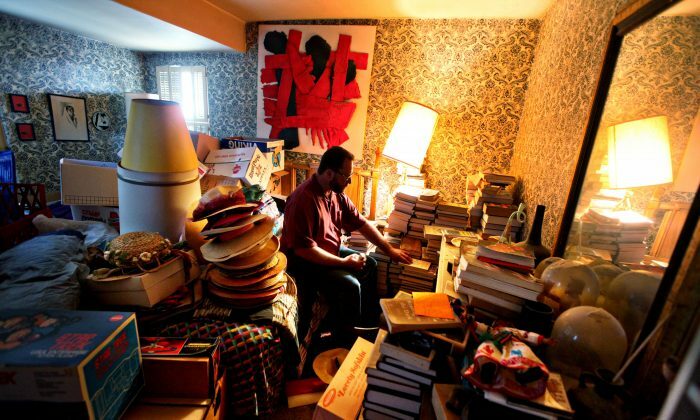 In every episode, hoarders know they have a problem, and they’re ashamed and isolated by the environment they inhabit. But the pain of letting go is too great. Christine Bowman has spent much of her life with hoarders—both professionally, as a Chicago-based home organizer, and as a child watching her grandmother struggle with hoarding. She describes her grandmother’s house as virtually unlivable: A tight pathway snaked through stacks of furniture, clothing, and other items, allowing just enough space to get from one room to the next. Even though only a small fraction of Americans meet the criteria of being a full-blown hoarder, these days it seems we all have more junk than ever. Many factors contribute to our materialism, including a culture of mass consumption, the capability to buy almost anything online, and a booming self-storage industry that happily houses our overflow. We also face bargains that seem too good to pass up, must-have electronics that we’re more likely to replace than repair, and a pervasive mantra that having more will make us happy. There are two basic rules to an organized, clutter-free life: get rid of the objects you don’t need, and ensure that the things you want to keep are easy to find. The concept may sound simple, but Bowman says there are several ways people can derail the process. One is not starting out with a good system for sorting. Bowman’s first step in helping a client tackle clutter is to set up boxes or bags labeled with simple categories: recycle, donate, throw away, or repair. Another roadblock is the flimsy excuses we use to talk ourselves into keeping useless clutter. One of the hoarders Bowman worked with couldn’t let go of anything because she couldn’t control what would happen to it after it left her house. What if her recyclables got tossed into a landfill? What if her clothing donations got thrown away? In her mind, getting rid of anything was too risky, so she couldn’t move forward. Teaming up with a friend, family member, or professional home organizer can help you stay on track when you’re deciding what to throw away, what to keep, and where to put it. A declutter buddy can also act as a sounding board for your excuses and help you retain perspective. It’s harder to justify keeping your junk when you have to convince someone else of its worth. More extreme cases of possession attachment may require deeper reflection. According to Janet Luhrs, author of “The Simple Living Guide: A Sourcebook for Less Stressful, More Joyful Living,” hoarding is not about the clutter. It’s about the hoarder’s emotional state. “Until the hoarder is able to take a look inside him or herself to see what’s causing the hoarding, nothing will change,” Luhrs said in an email. Trauma is the common theme Bowman recognizes in all the hoarders she has known. For her grandmother, it was living through the Great Depression—a time when people saved everything they had because they didn’t know if they would ever get anything else. Obsessive-compulsive disorder, anxiety, addiction, and unresolved grief have all been associated with hoarding. Whatever the backstory, hoarding often serves as a coping mechanism—creating a cocoon of objects to soothe an injured soul. This is why Bowman believes that people with chronic hoarding issues often need help to address their underlying trauma first, before tackling their stuff. Otherwise, the mess is bound to return. Try as we might, we can’t buy a sense of abundance. But we can cultivate genuine abundance by learning to appreciate the things we already own, while ditching the stuff that no longer serves us. Kondo has a view of possessions that may seem strange to the Western mind at first. She asks people to regard their things not as mere objects, but as living beings that deserve respect and purpose. Objects want to be used. Clothes want to be worn. It’s what they were created to do. If you can’t give them a job, it’s best to set them free. Instead of addressing your clutter by room, Kondo suggests to go by category (clothing, toys, books) and consider whether each item in that category brings you joy. If not, let it go. Tune in to how you really feel about each of your possessions, and you will suddenly notice the book you will never read, the hat you will never wear, or the immersion blender you never should’ve purchased. Done thoughtfully, this project may take a while to complete, but it saves a lot of hassle in the long run. Once you’ve pared down to the essentials, you won’t waste as much time and energy rummaging through things that no longer serve you, and it’s easier to find the stuff you actually want. You’ll also give your unwanted objects a chance to have a more purposeful existence elsewhere. Once you have a better feeling for what you truly value, it becomes easier to spot the items you don’t want. Having a place to put the rejects ensures they make it out of the house in a timely fashion. Bowman recommends keeping a permanent donation box to hold your unwanted objects until you have time to take them to their next home. “There’s a place always ready, so that when I see an object, boom, it goes right in there. Once a month, I take all the donations to wherever they need to go,” she said. In response to the material excess of our consumerist culture, more people are turning toward a minimalist lifestyle: smaller homes, fewer possessions, and more freedom. The 2016 documentary “Minimalism” highlighted this phenomenon, featuring one man who managed to whittle down his worldly possessions to a mere 51 objects. Bowman is a big proponent of adopting a more minimalist lifestyle, but she knows from personal experience that it can also go too far. In reaction to her grandmother and father (who carried on the family’s hoarding tradition), Bowman went the other way. For a time, she tried to live with as little as she could. She cautions that this can also become unhealthy—a coping mechanism at the opposite end of the spectrum. “We don’t want to be in excess, but we don’t want to be in a deprivation state. There’s this middle way. It’s about having the things you need to have the life that you need,” she said.